It’s rare that we make jambalaya, gumbo, or any Creole foods. Odd, too, because they are so tasty and always a hit. Since purchasing the Instant Pot, we’ve already made this sausage and chicken jambalaya more times than I can count, and gumbo is in the near future! Don’t get me wrong, I love simmering a large pot of food on the stove top. It makes the house smell wonderful and imparts so much flavor. The reality is, I don’t always have time. On those days, when we want a hearty dinner but don’t have time to babysit a pot on the stove, we use the Instant Pot. It’s quick, easy, and very low maintenance. That’s kind of how we decided to make jambalaya, pork chops with gravy, and wild rice and mushroom soup. John asked for the jambalaya, but we’ve been so busy lately that I didn’t think we’d have time to make it stove top. The Instant Pot was a lifesaver. 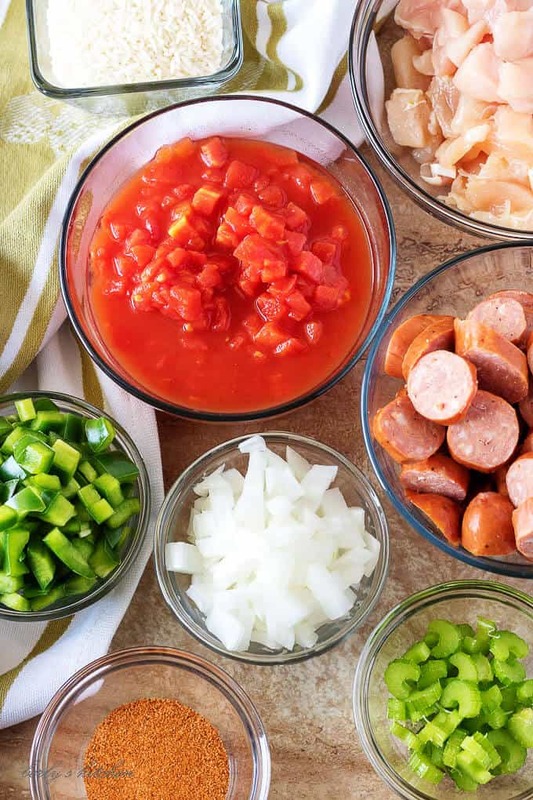 We took the usual ingredients like sausage, chicken, onions, celery, peppers, tomatoes, and seasonings, and adapted the process. It worked perfectly! This recipe involves a lot of sauteing, so start by setting the Instant Pot to saute. Add the oil, sausage, and chicken. Stir until the chicken is white on the outside. The chicken doesn’t have to be cooked through, just cooked on the outside. It will cook the rest of the way later in the process. It only takes 3-5 minutes to cook the chicken. Then use a slotted spoon to remove the meat from the pan. Leave the Instant Pot on saute and add the onions, celery, and peppers. Cook just until they’re soft then add the garlic. Be careful not to overcook the garlic, or it will become bitter. Add the Creole seasonings, bay leaves, and thyme. 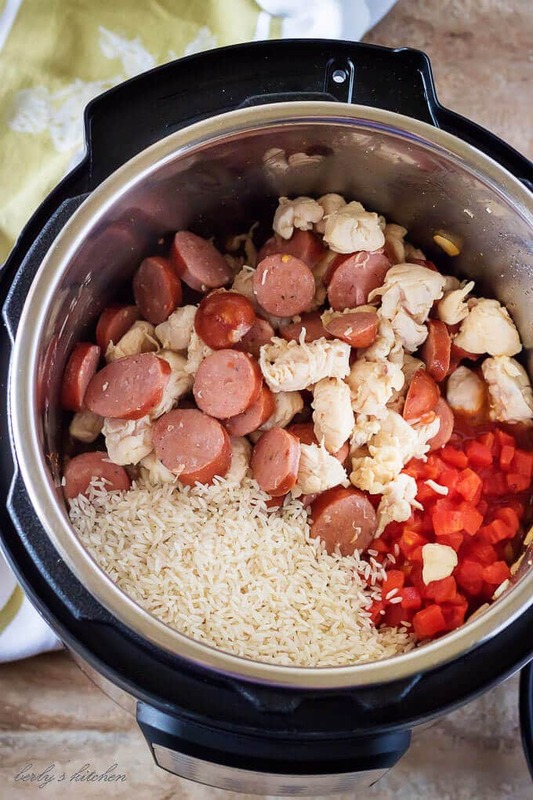 Carefully place the sausage and chicken back in the pot and top with rice, tomatoes, and chicken broth. Season with salt and pepper. Give the jambalaya a quick stir, and close the lid. Make sure the valve is set to “sealing,” and set to high pressure (manual/pressure cook) for 10 minutes. Allow the Instant Pot to natural release before doing a quick release. After the quick release, remove the lid and stir the jambalaya. Remove the bay leaves and thyme sprigs, and add additional salt and pepper if needed. Serve immediately! To ensure that you don’t get a burn warning, make sure to scrape the bits from the bottom of the pot. Some brands of sausage have a higher fat content and are less likely to stick. If needed, add a touch of extra oil in the beginning steps to keep food from sticking. Here’s a great resource that gives some tips about how to avoid a burn message. If it looks like the ingredients are on the lower moisture side, add an extra 1/2 to 1 cup of broth. Some readers report adding the extra broth and have had great results. If you don’t have Creole seasoning, swap it out with equal amounts of Cajun seasoning. However, the Cajun seasoning tends to be a bit spicy. We use 1-2 tablespoons depending on the spiciness of the sausage. The important thing is to flavor it to your liking! This also goes for the other seasonings like thyme and salt. Please use your best judgment. We used the amount that worked for our friends and family. It may not be the same for your household. To ensure even cooking, make sure the chicken and sausage are cut to similar sizes. The same goes for the vegetables. Many Instant Pot recipes are “dump and go” type recipes. We’ve made this one several times with no issues. However, if you’re worried about the burn warning (as mentioned above), check out the link listed in the first tip. The post covers how to layer the ingredients properly. 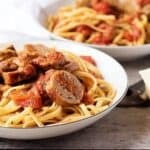 Have you tried our other Instant Pot Recipes? 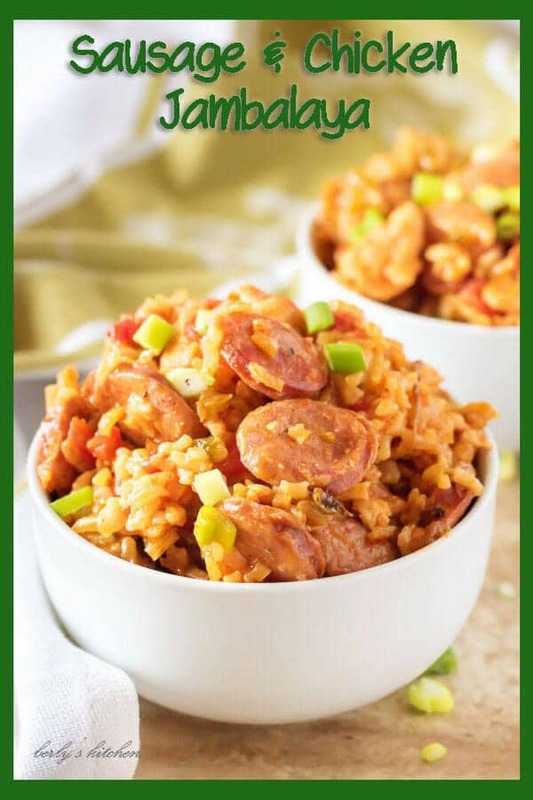 If you like this sausage and chicken jambalaya recipe, please leave us a comment and rate the recipe card. You can also find us on Facebook, Pinterest, Twitter and Instagram searching for Berly’s Kitchen! Add the onions, pepper, and celery stirring with the wooden spoon while scraping the bottom. Cook for about 3-5 minutes or until vegetables are soft. Add the garlic and cook for an additional 30 seconds while continuing to stir. Add the Creole seasoning, thyme, bay leaves, cooked sausage and chicken, rice, tomatoes, and broth. Stir to combine. Close the lid, make sure the valve is set to "sealing," and set Instant Pot to high pressure (manual/pressure cook) for 10 minutes. Allow the Instant Pot to natural release for 5 minutes before completing a quick release. Remove lid and stir. *This recipe was made in a 6-quart Instant Pot. *See the post for tips and best practices, specifically regarding how to avoid a burn warning. Family and In-laws LOVED it!! Thanks! Used 1 tsp dried thyme, that is all I smelled when the lid was opened. Would cut it down to 1/2 or 1/4 tsp dried thyme. Otherwise, a great recipe. Dave. Yum! Easy and delicious! I would also recommend cutting back on dried thyme… it is a bit much at 1 tsp, unless you really like it. My 2 year old loved it and hubby did, too (he added sriracha, which is a good idea for those who like it spicy). 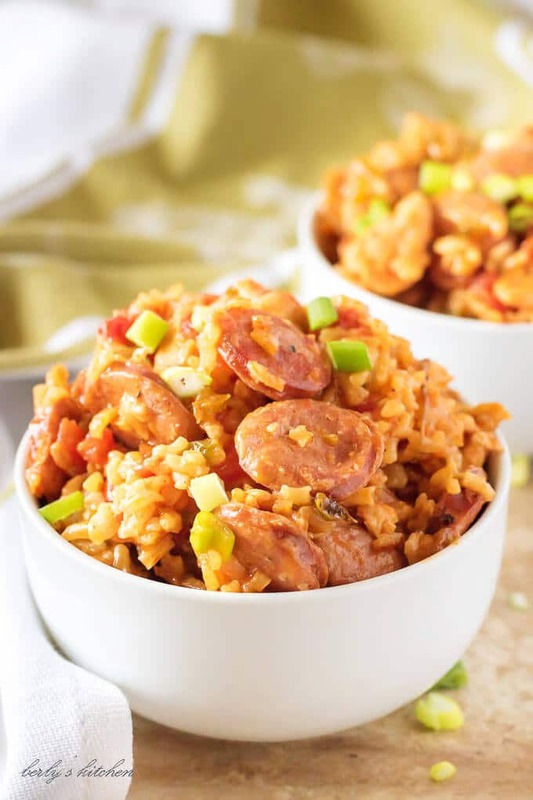 We’re so happy that you and your family liked the jambalaya. Thanks for the feedback on the thyme. We love that your husband added sriracha for a little kick. Wonderful idea! In the process of cooking it now. It smells fantastic but we kept getting the burn notice even after scraping the pot repeatedly. In an untried recipe there’s no way to know whether we have enough oil or liquid in the pot–we just have to trust the author–and one won’t know until it’s too late. In all honesty we’re still new to the Instant Pot and don’t know the ins and outs. This is our first burn notice. Desperate to salvage our investment in ingredients we’ve got the pot on Slow Cook and hope that the rice and chicken finish cooking. Is this one of those recipes where the ingredients should be added in order, like liquids and meat on the bottom and rice on the top rather than all combined? Any suggestions? Hi Ken! I’m so sorry to hear to that you’ve gotten a burn notice on this one! Sounds like you’ve scraped the bottom which is great. The ingredients are initially layered just by adding them to the pot. I stirred them a bit to make sure the rice was covered in liquid instead of sitting on the top. It’s possible that one of the ingredients didn’t contain as much moisture as an ingredient that we used. I’d recommend adding a little more chicken broth if possible, maybe a 1/2 cup to a cup depending on the thickness of the jambalaya. Hope this helps and that you’re able to salvage the recipe. I had the same thing happen to me…I got a burn notice. I believe that the newer instapot date very sensitive and the burn notice can come on if you have just the tiniest scrapings on the bottom. Hope your food turned out great!! Hi Ken. If you have an instant pot Ultra, they are notorious for getting a Burn Notice. You have to make sure that you stir anything with rice in it to get the Liquid on the bottom. I also add a little more liquid than most recipes. It’s not the fault of this recipe. It’s the Ultra. This recipe is a keeper! I’ve been without a stove for almost two weeks. My Instant Pot Duo Plus has been a lifesaver. This jambalaya turned out perfect. The things I changed up were, I omitted the chicken, and made it andouille only, and mixed up my own Creole seasoning. I used dried thyme, about 1/2 Tsp. Seems pressure cooking makes dried spices a tad more potent..
Can you freeze and store it? Good Morning Kayla, that’s a great question. Kim and I have never frozen it for storage; however, I don’t think it would be a problem. Go ahead and give it try, it should be fine. Have a great day, Kayla! Is there an option to add shrimp to this or would you recommend adding it cooked to the pot after it’s released? Hi Adrienne! We haven’t tried this recipe using shrimp. If you decide to try it, I’d recommend making a tray/holder out of aluminum foil. Place the tray on top of the ingredients just before closing the lid. However, I’m not sure if the shrimp will overcook or become rubbery. It’s definitely worth a try. Great idea! I would add uncooked shrimp at the end of the cooking time. Stir it in and close the lid for five minutes. The residual heat should cook the shrimp perfectly. Sounds delicious! If I were to substitute brown rice would the cooking times be affected? Looking forward to making it this week! Hi Chloe! Brown rice will take more liquid and additional cook time. We’ve never tried the jambalaya with brown rice, so unfortunately I’m unable to provide an exact amount of liquid. Here’s a post on a different site that has a great Instant Pot brown rice recipe that might be of some help. https://addapinch.com/instant-pot-brown-rice-recipe/ We hope you enjoy the dish! 🙂 Have a great weekend! If I do not want to use the can of tomatoes how much more chicken broth do I add? Good Morning Richard, that’s a great question. I had to do some research to find the answer. According to the links I found on Google, it looks like you may want to add about 3/4 to a 1 cup of additional chicken broth. I hope this information helps. Have a great day. do you have to saute saute, peppers and onions first ? Hi, Nan! No, you don’t have to saute them. As long as they’re added prior to closing the lid and cooking the jambalaya, it should be fine. 🙂 It’s whatever your preference. Just to clarify, the sausage and chicken do need to be sauteed. I didn’t see it listed in the ingredients you mentioned but wanted to make sure there was no confusion. We are so satisfied with our jambalaya tonight, thank you so much! My wife, in her wisdom, bought an Instant Pot Duo Mini (3 qt.) because we live in a small apartment with a very small kitchen. I am constantly on the lookout now for Duo Mini compatible Instant Pot recipes. Hello culinary friends on the internet, where are the Duo Mini recipes to be found? In any event, I thought that this one would be compatible and I was right. I matched every volume except I used no celery. My spouse doesn’t like too much spice so I used only 1 T of Tony Cachere’s Original Creole Seasoning, 8 oz. of which set me back $2 at our local Safeway! The pound of chicken and a packaged 11 oz. of Adouille Sausage (Silva Natural Smoked Andouille) came from the Whole Foods. The amount of liquid was just right, the cooking time was just right, the final result was just right! Our neighbor downstairs just lost her husband and when we found out how happy we were with our dinner we texted her and asked if she had eaten yet. The result: she kept what was left after consuming a good portion, and I may have to make this recipe again in a couple of days! Thanks again. Thank you, Greg! Kim and I are thrilled the recipe worked for your Duo Mini. Additionally, we are happy to hear you, your wife, and your neighbor enjoyed the jambalaya. Thank you again for coming back to site to share your experience. Have a wonderful day, Greg! I decreased the thyme to 1/4 teaspoon. I think I may omit it next time. Very good! Definitely enjoyed this dish. Thank you! I made this tonight. I sauteed the meats and the onion, green pepper, celery, and garlic on the range, and then put them all in the Instant Pot along with the drippings from the saute pan. I was hoping this would help me to avoid getting a burn notice. The recipe as published calls for three quarters of a cup of chicken broth, which seemed low to me, so I rounded up to one cup. The tomatoes and their juice were dumped in last, and just pushed down into the other ingredients. I got my first burn notice before the Instant Pot had pressurized. I scraped the bottom and tried again, but soon got another burn notice, so I added another cup of chicken broth. From there on, the process proceeded as hoped. The rice was overcooked, but the meats were just right. If I were to make this again, I would use one and three fourths cups of broth, not the published three fourths of a cup. Generally white rice calls for about one and three fourths to two cups of liquid for each cup of rice. I wonder if there is a misprint in the recipe. I’m puzzled at the positive reviews for this recipe as it stands. If anyone wants to try this recipe, I would recommend using no more than one tablespoon of the creole seasoning on their first attempt, unless they like their food very spicy. Hi Bonnie! I’m sorry to hear that this dish didn’t work out for you. It sounds like you tried to everything you could think of to make it a success with no luck. We make this often and haven’t gotten a burn notice like some of the comments mention. However, I do understand that brands and types of ingredients vary, and that can make a difference in the outcome of the dish. In regards to the liquid to rice ratio, we tested the recipe with 1/2 cup of broth, which was too little liquid. Then it was tested again with 1 cup of broth. The 1 cup amount was a little soupy and the rice was overcooked even though the official Instant Pot user manual and website states that the proper ratio of liquid to rice is 1:1. The recipe was tested again using 3/4 cup broth. We continued using that amount each time we made the dish with no issues. I’ve double checked the recipe and the amount of chicken broth listed is correct at 3/4 cup. I agree that starting out with 1 Tablespoon of Creole seasoning is a good idea! It can be quite spicy if you aren’t used to that amount of spice. Any of the spices in this recipe can be adjusted to taste. 🙂 The amounts listed are based on what our friends and family like best. Can you cook this without an instapot? I typically don’t leave comments but this recipe was fantastic. I made my own creole seasoning and I used a chicken andouille sausage to lower the fat. I follow Weight Watchers and I calculated a serving as 4 smart points with the chicken sausage. Thank you for sharing this recipe. It is now a favorite that will be added to my IP go to’s. I have an IP Ultra and got the BURN notice. The first time I added about 3/4 cup of water. The 2nd time it happened there seemed to be enough liquid in the pot so I finished cooking it on the RICE function. It came out great (although some rice was stuck to the bottom. ) with regard to the recipe itself the chicken I used was leftover rotisserie chicken. I just added it after everything was cooked as it just needed to be heated up. The dish was a hit with the family and I will be making it again. Thanks for the recipe. So I made this for this first time tonight, I didn’t have creole seasoning but I did have Cajun season and I put in 3 tablespoons in and let’s just say I forgot how spicy this seasoning was but it was still delicious! I had read about the “burn”notification so I put in 1 cup o chicken broth but I still got the burn notice. So I put in 2/3 of a cup of chicken broth in and restart the I.P. After that it came out perfect and was delicious!! Now I need to make another batch for my brother and his son but with maybe 1 tablespoon or less of the Cajun spice as he doesn’t not like it that spicy (wimp!). Made this for dinner tonight and it was so good!! I rarely comment on recipes. Cooked this pretty much as written. I put in a full cup of chicken broth. And let it do full depressre on its own. DELICIOUS!!!!!! Fabulous!! Wow!! This will be made again in this house!! Why can’t I give this 6 Stars??? New to instant pot cooking, but always have a hard time not soaking rice before I cook it. It was perfect. Making this recipe, again, for a family with a new baby today. Can this be doubled in a 6qt? We made this recipe in a 6 quart, and there was a lot of jambalaya. It was already pretty full. I wouldn’t recommend doubling it in a 6 quart simply because there’s not going to be enough space. It might work in an 8 quart, but we haven’t tested it. My whole family loved this recipe. I thought it was the perfect amount of spice, my husband added more creole seasoning in his bowl at the end. Will definitely be making this again. Thanks for the great recipe! Think I can add more chicken without adding more of the other ingredients? My family really likes this recipe, including my picky eater. We’ve made it 4 times in the last month by request from our picky eater. I cut back on the thyme, used Cajun seasoning, and added red peppers in with the green peppers. I add about another 1/2 cup of broth with the peppers Needless to say, this recipe is a keeper. Do you cook the chicken completely, or just partially? I know it said until the outside is white. Is it cooked through? Can’t wait to try it this week! (I’m going to substitute the sausage for turkey kielbasa). Very good. A little more to it than dump and go but worth it. My rice was still “toothsome” at the end of cooking time.. I repressurized the IP for 5 minutes and it’s still slightly crunchy (but not bad). Should I have added more broth? Would that make a difference? Spices are on point! Flavor is very good! This was absolutely delicious! My family thought it was a bit spicy but I think that was due to the sausage I chose.. organic chicken andouille. I didn’t make any changes.. never got. Burn notice! Thank you for sharing this! Amazing! This was my second recipe in my IP Duo. It turned out perfectly following recipe exactly. Thank you! Thank you for trying the recipe! We’re glad that you liked it, and hope that you enjoy your new IP. Happy Holidays! Very tasty and quick to throw together! This was a fabulous dish for a chilly night! I’ve had a little trouble with getting the burn notice on a couple of other recipes so I added a full cup of broth as others said they had done. I think I will cut it back to the recommended 3/4 cup next time since there was a small amount of liquid left in the pot when it finished cooking. I did use a small amount of wine to deglaze to pot after the saute step and I believe it added to the delicious flavor! 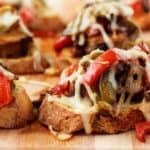 Great recipe love it other than I may have used too much creole seasoning. I would hit patches that were a little saltier than the rest. Didn’t add any salt. I made this tonight and it was fabulous! This was my second recipe and I’m so excited! Thank you! Very good. I had no issues with burning but stirred with a rubber spatula when sauteing just to make sure nothing stuck. We dont like a lot of heat so I cut the creole in 1/2. I also left the bay leaf out because I forgot it. Just made it and I think it’s great! The chicken didn’t seem to absorb much flavor though. Suggestions? I made this last night and my husband raved about it and said it was one of the best meals I’ve made, and I cook A LOT! Thank you for a wonderful and easy recipe. I used chicken thighs and sautéed in batches to get some color on the chicken and omitted the thyme. Otherwise, I followed the recipe as is. Since I am cooking for just my husband and I, I would like to cut the recipe in half. How would this impact cooking time? I loved this recipe, perfect amount of spice! I doubled the amount of rice, chicken broth and added another can of tomatoes but with green chillies! It turned out perfect! I like having leftovers for lunch for a few days and this was perfect! I actually made this with out the tomatoes. My husband forgot to pick them up at the store and I didn’t realize til I was already committed/started with all the other ingredients. So I went ahead and made it without. To my surprise it came out really good. I think the flavors actually popped more without the tomatoes and they would have with. I could readily taste all the separate flavors that I think would have been more masked by the tomato which would have given a more blended flavor. So although I think it would be great with I also think it’s a great change without.